Lightweight–only 10-12 lbs! More freedom of movement means an increase in productivity and reduced labor costs. 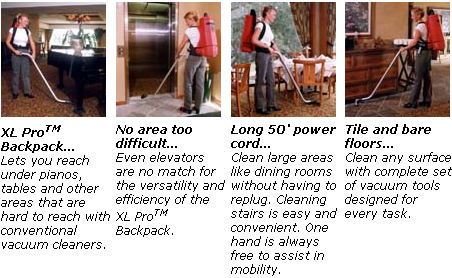 Perfect for casinos, hotels, motels, hospitals, offices, airports and anywhere that calls for multi-use cleaning tasks. Tapered design increases airflow and efficiency. Includes a full set of 5 tools with convenient tool belt. Bag support plate ensures a continually efficient airflow. 50' StayLock Safety Extension Cord. The Bissell BGPRO10A is an easy to use back pack vacuum for commercial environments. It is perfect for casinos, hotels, motels, hospitals, offices, airports and anywhere that calls for multi-use cleaning tasks. • BGPRO10A: 10 dry quart capacity, 12 lbs. • BGPRO6A: 6 dry quart capacity, 10 lbs.